Many thanks to Geoff and George. "How about this list of city centre gay venues in 1958. Yes! 1958! The Old Garrett (Original Building), The Union Hotel (it’s then name), The New York Inn (it’s then name), The Trafford Bar, The Prince’s Hotel, The Cafe Royal, The Concord Bar in the Midland Hotel – yes! you read that correctly!, The Garrick Hotel, The Thompson’s Arms (original building), The Kingston (now called Paddy’s Goose), The Waldorf (the one in Cooper Street). A spot for a late night coffee or snack (maybe something else!) was the Bus Stop cafe - known by the gay crowd as the snake pit! As a matter of additional interest what is now The Rembrandt was then in the pre-fire building and had the original name of The Ogden Arms. The licensee at the time was gay hostile – so we certainly weren’t welcome. 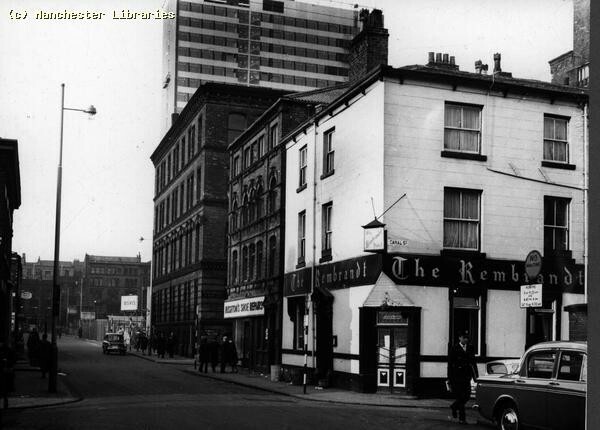 That pub became gay when a gay licensee took over in February 1961 and the name became The Rembrandt later that year."